Robots are machines which have been programmed to implement series of tasks independently or semi-autonomously, while Automation involves the use of computer software, machines or other technology to implement tasks which would normally be handled manually by human workers. Robots and automation have applications across several fields such as the military, agriculture, manufacturing, forex trading and the renewable energy industry has not been left out. The tasks to be done in renewable energy companies have increased and are becoming complex engineering challenges, therefore requiring the application of robots and automation to save time, increase productivity and optimize performance. Renewable energy as it is described is energy that is inexhaustible and is constantly being recycled. The sources of renewable energy include sunlight, water, wind, geothermal heat, and other various types of biomass. The renewable energy industry has seen many advances in the methods used and products manufactured to harness the natural energies of the sun, wind, and water amongst others. 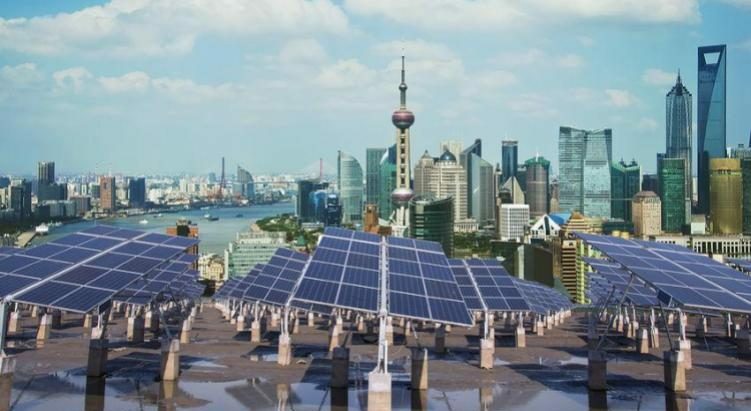 Solar energy, wind energy, and hydroelectric energy are three major fields of renewable energy where many companies across the world are actively involved and major successes have been recorded in these fields. Today, solar energy is becoming largely harnessed for power generation of a significant quantity of electricity. The demand for solar powered devices and solar panels has risen so much that the manufacturers of solar panels cannot rely only on human workers in the manufacturing processes. How are renewable energy companies using robots and automation in their operations? The application of robots and automation is helping companies in the solar energy manufacturing space to make smart and instant production decisions, which minimizes the cost of labor and improves productivity. Examples of stages in solar systems manufacturing where robotic automation has been introduced are silicon ingot, silicon modules, solar cells and silicon wafer. For example, “Jinkosolar” is a company in the solar energy industry which claims to be the largest manufacturer of solar photovoltaics in the world. Jinkosolar now produces a new model of solar cells called the “p-type monocrystalline perc solar cell” which currently holds the new record for solar cell efficiency at 23.45 percent efficiency as against its previous record of 22.78 percent. Jinkosolar was able to achieve this through the application of advanced technologies such as intelligent mobile devices, IoT devices and mobile robots in its manufacturing processes. Another example of a well known robot company with special interest in the solar photovoltaic market is ABB. ABB uses high speed compact robots for handling of wafers and solar cells. 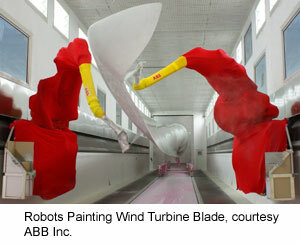 Robotics and automation is making huge impact on major aspects of wind turbine manufacturing. Wind turbine blades and their turbine towers are two very important aspects of wind turbine manufacturing and ABB is one good example of a company that works in the manufacturing of both. ABB attributes part of its success to the application of robotics and automation. The time required to paint, sand and polish turbine blades has been drastically reduced from days to hours. The implication of this is that more production can be done within a short time. Robots are able to evenly distribute paint over the entire blade surface and achieve uniformity due to machine precision. Manual application of paint cannot be done with as much precision as robots which could result in blades having balancing problems. Manufacturing of wind towers would be extremely difficult and time-consuming if the manufacturing companies have to rely on only human workers. Robots come in useful in welding of certain structural components for turbine towers because of their unique geometry. Robots are applied in sharpening the edges of gears, to trim and grind the blade flash, and to also drill and cut blade roots with a high level of accuracy. Robots are needed to handle the finishes of turbine blades because they are very large and have contoured surfaces. The application of robots and automation in the wind turbine industry is a must if the quality of production must be consistent. Manufacturers of Wind turbine would not want the regular breakdown of parts within the turbine system because of the difficulty involved in getting someone up there to repair or replace parts. KMT Robotic Solutions is a company in Michigan which makes use of robots for drilling and cutting of turbine blade root end. According to KMT’s Business Development Director, Roberta Zald, The use of robots to processing turbine blade roots offers a lot of benefits. The benefits include reduced set-up time, flexibility and more productivity. 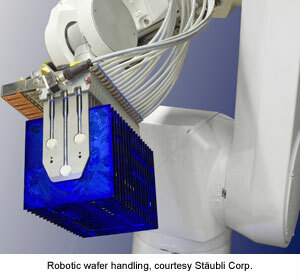 Similar to wind turbines, robots are used for fabrication of parts in hydroelectric turbines. In hydroelectric turbines, Wicket is a part which serves the function of regulating the inflow of water. For descriptive purposes, wicket looks like the louvers in Venetian blinds which regulate the amounts of light entering a room. 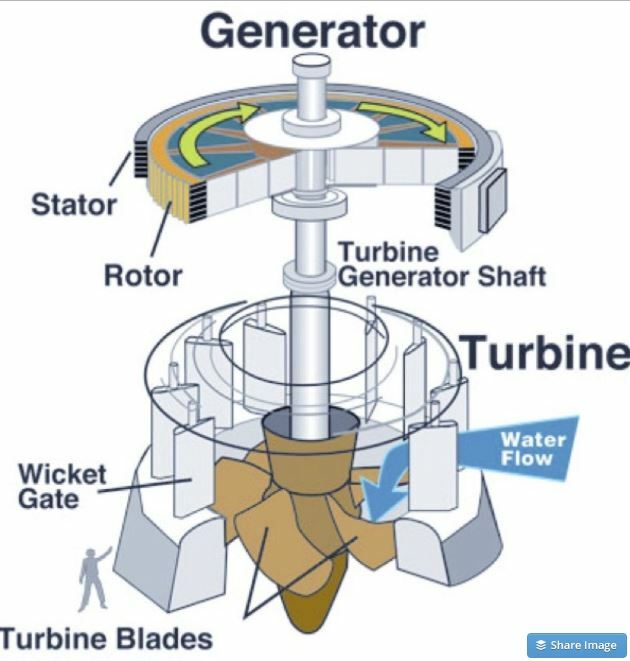 The wickets used in hydroelectric turbines are too large to be manually welded. They are large metal pieces with length ranging from 10 to 15 feet, width is 3 feet and the thickness ranges between 6 to 10 inches. Due to the method used in welding wickets which require rotating them in order to access every part, only flexible robots with multiple motion axes have the ability to successfully weld. Genesis Systems Group LLC in Iowa is a company that handles welding of wicket gates in hydroelectric plants. Genesis uses Robots because the cycle times are prolonged when done manually. Robots offer consistency in the outcomes when used in welding wicket gates and because wickets are exposed to tremendous amounts of stress, structural problems might arise if the welds have inconsistencies and voids. Robots and Automation are crucial in the manufacturing of products designed to harness renewable energy sources. The complexities of some of the designs of renewable energy harnessing products require machine precision which human workers cannot provide. For other tasks which human workers had fit in successfully, automation offers a faster and more efficient means of implementing such tasks thereby saving time, cost of labor and also cost of production. An increase in the application of robots and automation by renewable energy companies may lead to an eventual total shift from other sources of energies such as petroleum to safer sources of energy such as sunlight. Do you know any more cases of robots and automation used in the renewable energy industry? What are the potential engineering challenges for their application?